Using only a stem of a striking pink Oriental Lily, some greenery and a simple wrap, this elegant bouquet is the exemplary choice to heighten the day of the sophisticated someone in your life. 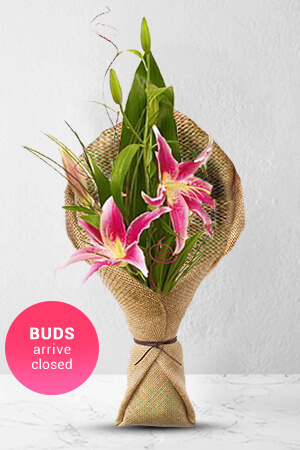 Simplicity is the key to portraying elegance.Lilies may be sent closed/partially closed in order to prevent damage and to last longer.The vase in the picture is not included, however if you would like to make your flower gift extra special, why not add a vase to your order? We recommend a Standard Vase to leave a lasting impression. Perfect again ...... no matter where in the world you are ... flowers will always put a smile on the receivers face. The reminder was really helpful.